If you like French toast, you will love bostock. I first learned about this French pastry from my workplace. It’s a brioche slice dipped in syrup, baked with almond cream and almond slices on top. The result is a tender and moist cake-like brioche with a crunchy-topped custardy almond cream. The texture resembles that of a French toast, especially its syrup-py goodness. Though perfectly delicious on its own, my twist includes sliced “plumcots” baked on top. Plumcot is a hybrid of plums and apricots, they are generally sweeter than plums and have more complex aromas. There are many varieties, each have their distinctive colour and flavour. 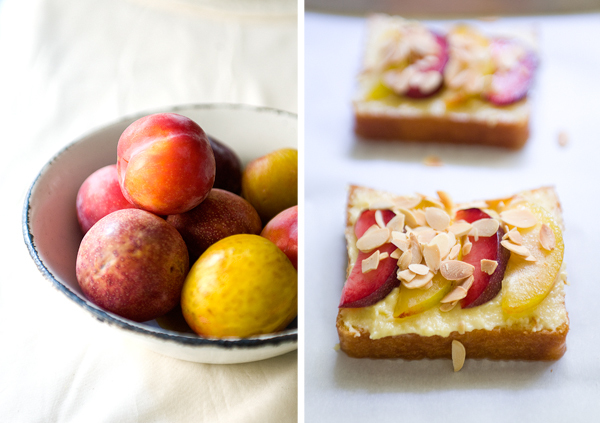 This plumcot almond bostock was inspired by a more classic dessert – the plum and almond tart. The slight acidic taste of the plumcots contrasts nicely with the sweetness of the almond cream. I made a brioche loaf to satisfy my craving for bostock, but any stale brioche loaf would work. It is an ingenious way to make leftover brioche into something to die for. In a small saucepan, cook together sugar and water until sugar has dissolved. Cool to room temperature before adding orange blossom water. Set aside until ready to use. In a medium bowl, mix softened butter, icing sugar, salt, and almond flour with a spatula. Blend in vanilla extract and egg until incorporated. Mix in flour last, chill in fridge until ready to use. Line a sheet pan with parchment. Set rack in the middle of your oven, preheat to 375F. Place syrup in a small bowl, big enough to soak in a brioche slice. Quickly dip brioche slice into the syrup and take out, drip off excess and place onto the prepared pan. Continue with the rest of the brioche. 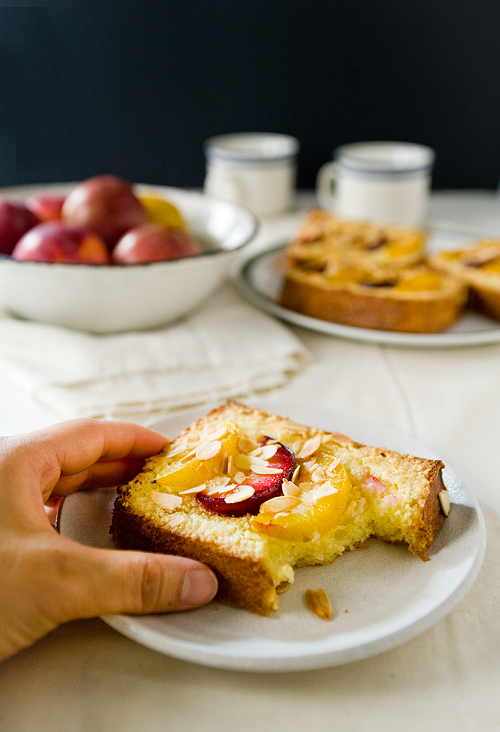 Spread a thin layer, about 2 tablespoons of almond cream onto the soaked brioche. Arrange 4 slices of plumcots on top, sprinkle top with about a tablespoon of sliced almonds. Finish the rest of the brioche slices. Bake for 15-20 minutes, until the almond cream is slightly golden around the edges. Serve slightly warm or at room temperature. 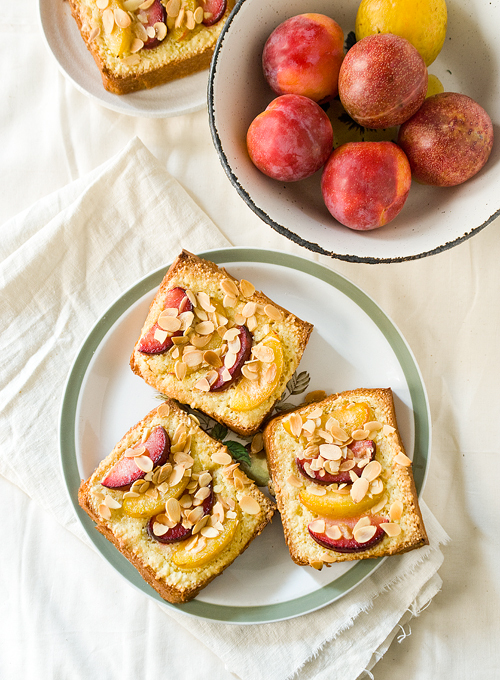 To make a classic bostock, simply omit the fresh plumcot slices, and garnish with a light dusting of icing sugar after baking. I love eating it by the hand, the subtle orange blossom water aroma balances the plumcots and almonds beautifully. I also love the contrast of the different plumcot colours. Bostock usually taste the best a little warm or at room temperature at the day it is made, but it keeps moist for a day or two. It is so delicious that it is hard to believe that it was once a slice of stale brioche! YES to anything brioche (and bostock). These look awesome.